In a new venture for Off the Rails Arthouse, we are delighted that Fife-based artist, designer and teacher Andrew Parry is offering a workshop in hand built ceramics! Andrew will introduce you to techniques such as slab or coiled pots, ceramic sculpture and tile making and decorating (please note this course does not include not throwing on a wheel). It will be ideal for anyone who wishes to take their work into three dimensions for the first time, or enhance existing skills. It will be especially good for teachers. Because we need to build in time for firing your work, the workshop is offered in two parts. Everyone needs to do the first part, one whole day on Saturday 4 November, when you will produce your hand-built artefact. This will then be fired. The second session is an optional half-day, though greatly encouraged. For those who wish it, you will have a chance to glaze and decorate your piece of work, which again will be fired afterwards. This will take place on the afternoon of Sunday 19 November (details below on website). Students’ pieces, whether decorated or not, will be available for collection from Off the Rails Art House on an agreed date. Day one, on Saturday 4 November starts with an introduction to ceramics and the basic properties of clay. Andrew will discuss the materials and tools used and he will provide examples of both traditional pieces and examples of more contemporary techniques. 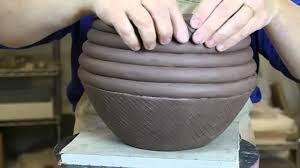 You will learn how to handle clay, and how to build pieces using coiling and slab building techniques. You will be encouraged throughout the course to develop creative ideas whilst learning how to realise these in sound structures which can be fired in a kiln. You will also learn how clay can be worked at different stages of the drying process. Cost £48 for day one. This includes all materials and firings.